Along with UW- Madison professors Leslie Bow and Lori Kido-Lopez, Yu had been working with Dr. Ed Holmes, Overture’s senior vice president for equity and innovation, on a free panel discussion prior to the performance, titled “Perspectives on Miss Saigon: History and Community,” to discuss issues surrounding the popular musical, which have been raised since its debut on London’s West End in 1989. The official reason Overture gave for cancelling the discussion was listed in a press release as “a misunderstanding with the people that we were collaborating with for this dialogue. It appears that we were not all on the same page as to our goals, objectives and the purpose for tonight’s event.” Overture’s release said the event had been “postponed,” but no replacement date has been proposed. In a phone conversation with Isthmus, Yu says he began meeting with Overture staff in February, and agreed to help coordinate the panel discussion. His objective was to ensure that the Asian American perspective was represented in a conversation with the larger community about the show. In the essay he posted on the Asian American Studies page of the UW-Madison website, Yu detailed the fraught history of the show, from using “yellow-face” — hiring Caucasian actors to play Asian characters and using makeup techniques to change their skin color and eye shape — and perpetuating stereotypes that portray Asian women as hyper-sexualized whores or “lotus blossoms.” Critics have also said the musical trivializes the Vietnam War and reinforces the Imperialistic “white savior” mythology. Yu says Overture staff invited him to write the essay, giving him a 48-hour deadline, which they planned to insert into Miss Saigon programs. Overture CEO Sandra Gajic disputes that version of events, contending that her staff told Yu they would “see what we can do to make sure his voice was also represented,” but a program insert was never an option. “We can’t put anything in our program books,” she explains, referring to agreements with the touring company Broadway Across America. Bow also expressed her surprise that, via email, she had been effectively fired from her role as moderator of the panel days before the event. When asked about the sudden cancellation of the panel, Gajic states that communication between the concerned community members coordinating the panel and Overture Center representatives had broken down in the week before the scheduled event. There were disagreements on who would be on the panel, the format of the discussion and the questions that would be posed. For instance, instead of inviting Lori Kido-Lopez, a scholar in representations of minority groups in mainstream media, Overture asked Four Seasons producing artistic director Sarah Marty to be on the panel, to represent the perspective of a local theater producer. Marty’s company produced a staged concert version of Miss Saigon in 2007. After reviewing the questions that panel moderator Leslie Bow had compiled, Gajic believed that the tone was “adversarial” and that she felt some questions amounted to “a personal attack” on her. She was also unhappy that questions had been tailored to each individual panelist’s expertise, rather than being open for any panelist to respond to. “Blaming Overture and me personally for having Miss Saigon in our season put us in an unfair position,” she explains. When asked if she thought the controversy would affect the venue’s box office, Gajic was unfazed. “We’ve already reached 105 percent of our ticket sales goal for the show,” she says, and indicated that the ticket office had been busily fielding calls that day from people who were looking forward to seeing the show. “Vietnamese, Asians — many of them love the show,” she says. 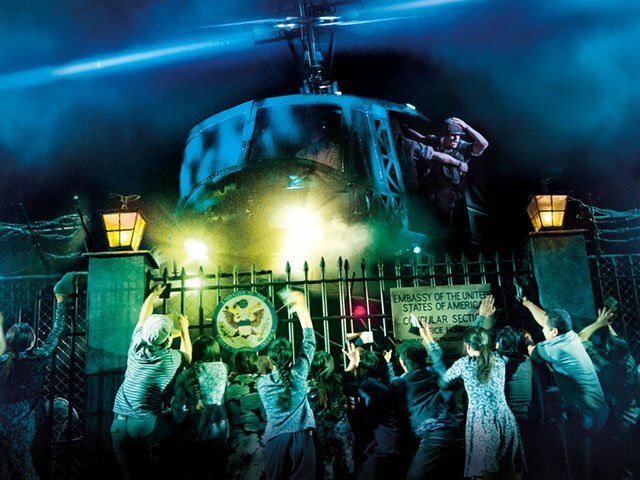 Gajic says she was not aware of any other public outcry around this newly retooled version of Miss Saigon, which has been on tour since 2017. The updated musical is billed as grittier and more realistic, focusing on the Vietnamese perspective on the end of the war. Also, the Asian characters are all played by Asian actors, in contrast to the original production. The lyrics have also been updated in places, using Vietnamese phrases instead of the gibberish used in the original version. Some Asian and Asian American audience members insist the musical cannot escape from its problematic source material, the Puccini opera Madama Butterfly, and that these changes do nothing to address larger story issues. Gajic acknowledges that she’s aware of the protests of the previous iteration of the show in St. Paul, Minnesota, in 2013. Eventually those demonstrations led to the Ordway Center for the Performing Arts pledging it would never host Miss Saigon again. In response to a question about programming, Gajic says that Overture Center was not required to host Miss Saigon as part of their partnership with Broadway Across America. “We had a choice,” she says, emphatically. She adds that Overture reached out to the panelists repeatedly, offering them space in Promenade Hall for the teach-in, and also offering free tickets to the performance, since many had no personal experience with the show. Gajic says she hopes the panel discussion will still take place, with all of the previously engaged panelists, after the show’s run, perhaps later in April. And she pledged to be on hand to answer questions during the teach-in, along with Overture board members, Holmes and Lex Poppens, vice president of marketing & sales. However, during the event outside Overture’s front entrance, Overture officials appeared to be milling around in the lobby, rather than interacting with the speakers or members of the audience.